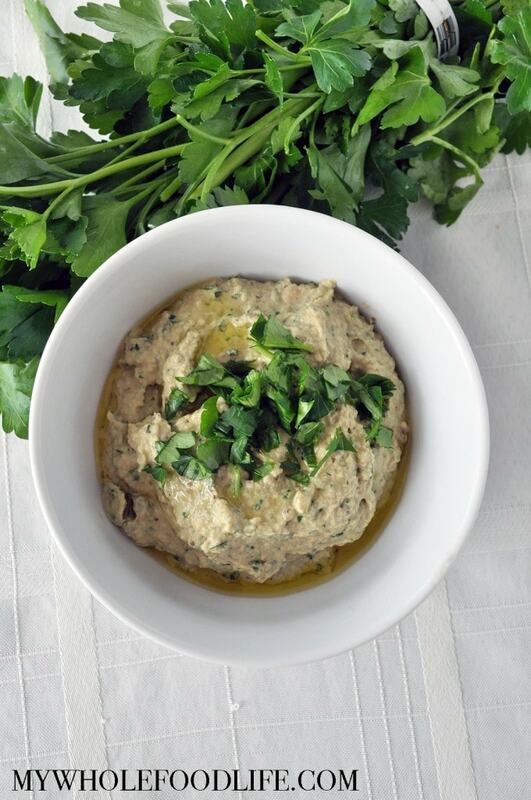 You have to try this Easy Baba Ganoush recipe! My husband is half Turkish, so we eat a lot of Turkish food. So delicious! My mother in law typically uses yogurt in her baba ganoush recipe, so we didn’t use hers. We made this vegan baba ganoush on our own and it came out so good! Some other Turkish recipes we have on the blog are hummus, white bean salad and red lentil soup. This version of Baba Ganoush is vegan, gluten free and paleo. You can serve with a drizzle of olive oil and some fresh parsley for a pretty presentation. Perfect for veggies, chips, or whatever else! Cut the eggplant in half and place it face down on a lined baking sheet . Roast 30 minutes, or until soft. Once cooled, scoop out the flesh and add it to a food processor with the remaining ingredients. Garnish with a drizzle of olive oil and more chopped parsley. This should last at least 5 days in the fridge. Enjoy! Thanks for the recipe. I'm always looking for recipes without tahini in them because of allergies. I actually did add tahini, but forgot to put it in the ingredient list! I edited the post. You might be able to just omit it though. I replaced tahini with hemp seed and it turned out good. My husband loved it! I subbed avocado oil for the tahini (allergies here as well) and it came out great! A light tasting olive oil would probably work too! Have you cooked the eggplant in the instant pot vs oven roasted? If so, did it affect the flavor? No not yet. I don't think it would effect the flavor at all. Thanks for sharing the recipe. I had never heard about this recipe. I am always looking for creative recipes. This looks delicious. I Will definitely try this recipe. I read so many recipes. But I like this recipe. Pictures that you have used are amazing. I can't wait to try this one.. I am going to try this. Thanks for sharing the great recipe.